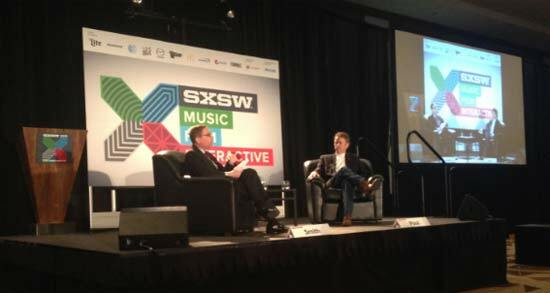 Presumed presidential candidate Rand Paul, R-Ky., discussed his "hypothetical" presidential campaign at the South by Southwest festival in Austin, Texas, Sunday. The 45-minute interview with Texas Tribune CEO Evan Smith focused heavily on tech, as the republican senator from Kentucky tried to appeal to a young voter base. His presence at the festival alone was an attempt to influence the young, tech-centric crowd. Paul has not officially announced his candidacy, but he did discuss some of the changes he would make if he is elected as the 45th president of the United States in 2016. No. 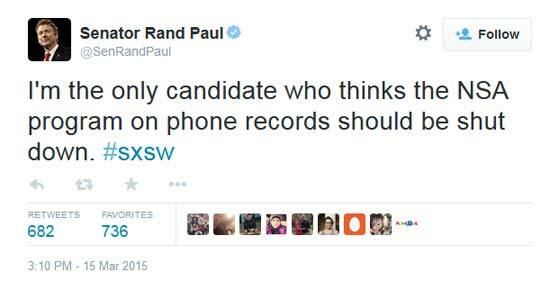 1: Rand Paul wants to end NSA's bulk data-collecting. Paul condemned the amount of bulk data-collecting the NSA conducts on U.S. citizens, claiming the agency's practices have violated the Fourth Amendment. "We do have a need for intelligence, we do have a need for the NSA – they just need to obey the Bill of rights," Paul said. He emphasized how important the privacy issue it to his campaign saying "I'm the only candidate who thinks that the NSA program on bulk collection of your phone records should be shut down." A well-timed tweet from the senator's office reiterated the point. He also didn't miss an opportunity to needle President Obama on the topic. "[President Obama] showed much less regard for privacy than the Republicans did before him," Paul said. No. 2: Rand Paul wants to fix the net neutrality debate. At one of the largest tech conferences in the world, Paul did not miss the opportunity to discuss the net neutrality debate. Paul said that he supports open Internet, but he does not think the Internet should be classified as a utility like the FCC ruled last month. He drew the comparison to the U.S. postal service and how different rates are charged for speed of delivery. He continued that it is not the role of the government to meddle in the free market place of the Internet. The key, he says, is preventing monopolies in the industry. His sentiments reflect the GOP party line that opposes the FCC's net neutrality ruling. What is Rand Paul's position on immigration ( reform )? As far as I can tell, it is not substantially different that anyone else's. That is, he is for some form of amnesty, as is President Obama or President George W. Bush also were when in office. Both parties know they can no longer win the Presidency without the Hispanic vote. Conservatives, White votes alone won't win elections anymore. Today, you must build diverse collations in-order to win. These are the political facts of life in contemporary America. So far, the Republican Party has been slow to figure out the social changes that have already taken place. That is why they lost the last two elections. Its is time to field a Hispanic running-mate for the next set of Presidential candidates. Its not a war on women, its just a matter of priority.